CSSSA offers an exciting, preprofessional, collegiate-level Dance Program designed for students who are interested in pursuing a college degree and/or a professional career in dance. All dancers who apply to the program should have prior experience of at least two (2) years of technical training in ballet or modern dance. 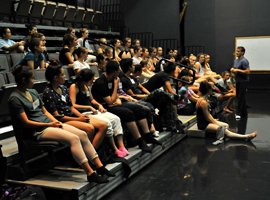 The Dance Program is designed to give students the tools and education they need to explore different styles of dance technique. 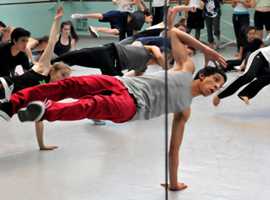 Students are also provided with a stimulating environment in which to begin the creative choreographic process. All dancers are required to participate in mandatory ballet and modern technique classes as well as improvisation and composition classes daily. Repertory workshops and seminars are included, as well as master classes and rehearsals, with guest artists round out this powerful four-week curriculum. Dancers will enjoy master classes and performances by guest artists in a variety of dance genres, such as Chinese, Flamenco, Bollywood and African Dance. They attend lectures on topics ranging from injury prevention and anatomy to dance history. Dance students may take field trips to dance events in the Los Angeles Area. The program culminates in a demonstration for the rest of the school of works that have been developed over the course of the program. Dance Program applicants should be aware that this is a very strenuous and comprehensive program, largely centered on technique classes and creative work taught by professional teachers and guest artists. The program is intense and students are expected to be fully engaged in the entire curriculum. Students must arrive at the school in good shape, free from injury or illness and ready to work hard in a challenging environment. Applicants who cannot commit to the entire four-week program will not be admitted. All students take a 1.5-hour ballet technique class four days per week. The class focus is on correct placement and alignment as well as agility and strength. Students are given the right tools to use in correcting potentially harmful habits. Emphasis is placed on proper work ethic and the fundamental basics that provide for the longevity of an artist’s career. Performance quality and work ethic are also stressed. There are opportunities for pointe repertoire and/or ballet technique for students who have been on pointe for two years. Students take a 1.5-hour modern dance technique class four days per week. During the four-week course, they study differing styles of contemporary dance. In contemporary repertory, the dancer learns original choreography. This class is held twice each week for all students. Students may learn original choreography or modern repertory from the contemporary dance field. Study in improvisation is used to stimulate the creative process by allowing the movement to come through in its most original and immediate response. Improvisational skills will be discussed and demonstrated. Students will be challenged to solve problems through their improvisation and collaboration. 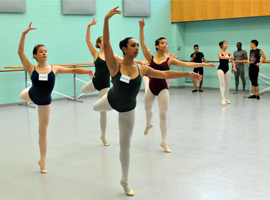 Composition is a very important element of the program for all CSSSA Dance students. In Composition Class, which is held twice each week, students engage in creative problem solving to build a foundation for choreographic expression. The class develops each student's confidence and self-awareness, and allows dancers to discover their own unique ways to move. Held three days each week, these classes are led by some of the finest commercial dancers, teachers and choreographers in California. Students take a weekly mat class based on the theories and principles of Joseph H. Pilates. The class teaches young dancers how to develop core strength and techniques to maintain a healthy body and prevent injuries. Learn tips on how to prevent, recognize and treat basic injuries common to dancers. Learn the importance and relevance of technique, strength, flexibility and nutrition and their effects on your body. Get one step closer to being a more informed and injury-free performer! As a part of each summer session, performances and lectures by special guest artists, choreographers, and companies are scheduled. Recent guests include Alonzo King and LINES Ballet, Bill Evans, The Joe Goode Performance Group, Gregory Dawson from Lines Ballet/Dominican University of California, Donald Byrd/The Group, the Cerulean Dance Theatre Double Dancing, The Changing Systems Performance Group, choreographer Garth Fagan, Helios Dance, flamenco artist Juan Talavera, dancer/choreographer Jonathan Lund, Alice Lo, Diavolo Dance Company, DawsonDance S.F., and the Marla Bingham Contemporary Ballet. Kirsten Roberts, Chair of the CSSSA Dance Department, received her Doctorate in Physical Therapy from the University of St. Augustine in 2010. While completing undergrad and grad school, she danced professionally with San Diego Ballet for 8 seasons as well as performing in the Urban Nutcracker in Boston for a season. She has also guested with Southern California Ballet and many others over the years. She specializes in treating dancers from the beginner to the professional levels and is currently one of the Physical Therapists for Texas Ballet Theatre in Fort Worth, TX. Kirsten is an avid presenter and is passionate about education. She is a certified Pilates Instructor through the APPI and is the Master Trainer for the United States, teaching courses all over the States, and abroad. Kirsten received her Associate teaching diploma in the Cecchetti Method of Ballet and has put many students through their exams. She also received her final Diploma in the Cecchetti Method in 2012. Kirsten is passionate about dance, injury prevention and education and has taught ballet, pointe and variations, anatomy, nutrition, pilates, and injury prevention for many years. She has been an instructor at CSSSA since 2012. Sylvia Palmer-Zetler, Chair Emeritus of the CSSSA Dance Department, is the Director of Cecchetti Studies and Founder of the Southern California Youth Ballet. She has her Masters Degree in Creative Teaching Techniques and is a Fellow and Examiner for Cecchetti USA and Cecchetti International Classical Ballet. Sylvia serves on governing Board of CUSA. Her professional dance career was with the National Ballet of Canada. Many of her students are performing in major companies in the U.S. and England, some who have won top awards in the U.S., Canada, and Europe. Gregory Dawson studied and performed with Dance Theatre of Harlem, Theatre Ballet Canadienne, Oakland Ballet, Berkeley Ballet Theatre, Sacramento Ballet and the San Francisco Opera Ballet. Mr. Dawson joined Alonzo Kings LINES Ballet in 1987 till 2005, currently he teaches and is resident choreographer for Alonzo Kings LINES Ballet BFA and Professional Programs and premiered his company Dawson Dance at CSSSA in 2008. He feels well prepared to pass on his knowledge to the next generation of young dancers. Justin Viernes started his professional dance career at age 16 and is extensively trained in ballet, jazz, modern and hip hop. He has recently danced in Buenos Ares, Kazakhstan and Belize as a U.S. Cultural Envoy. He performed for Fusion Dance Co., Khamia Somphanh, Sound Dance Company, Yolande Snaith, and The PGK Dance Project. He is currently a senior company dancer for Malashock Dance and is the Artistic Director of brown paper bag dance co. Justin currently resides in Philadelphia, PA where he continues to pursue a bi-coastal career as an independent artist with various companies and artists. Stephen Di Biase is a native of Toronto, Canada but grew up mostly in Southern California. He began dancing in college and went on to train at the Ailey School and Lines Ballet Training Program. He has also attended Jacob's Pillow and Springboard Danse Montreal. Stephen works as a freelance dancer in San Francisco where he is a resident core member of the SF Opera. He is also a company member at Maurya Kerr's tinypistol and Angela Dice Nguyen's The MoveMessenger(s). Stephen has been fortunate to work with other companies such as Oakland Ballet, Levy Dance, and the SF Symphony.